Our Brownie troop has been working on the new Outdoors Journey during their last year as Brownies. It was an easy choice as our troop loves to be outdoors and learn new adventures. We are very happy that Girl Scouts added this Journey! 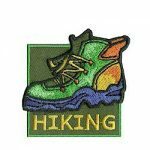 For their Hiking badge, they first worked on safety and they had previously earned their First Aid Badges including making their own First Aid kits. I am very fortunate to work for the National Park Service (NPS) and know of the many activities for Girl Scouts of all ages. If you would like to reach out to your local National Park, www.nps.gov, contact the main number and ask for the Education department. From there, they can help you with an activity the girls need to work on, including service projects and the Take Action Badges. Our troop is 3rd Graders and we can’t wait until they get into 4th Grade as Juniors! The NPS has a wonderful program called Every Kid in a Park. This is a wonderful program for 4th Graders and their families. The best part about it is that it is absolutely FREE! It is a free annual pass good for the school year. Here is link for pass: https://www.everykidinapark.gov/. 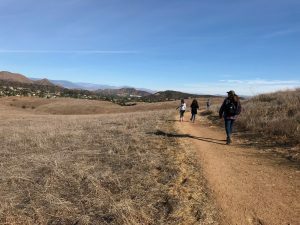 For our local National Park Santa Monica Mountains Recreation Area, I reached out to one of our Education Specialists. She informed me of the many programs going on especially during the weekends. One of the programs was Making a Dream Catcher with a Native American at the Rancho Sierra Vista/Satwiwa location. I thought it would be fun to do this at same time as going on a hike with the girls. Satwiwa also happens to be where many Chumash Indians lived. It is considered a sacred area. The girls were excited to do this and we met on a Sunday morning around 9:00am. Hikes later in the day can get quite hot here in Southern California, not matter what the season is. We hiked about 1 and ½ miles each way. The air was so clean and the views were gorgeous. We reminded the girls about Leave No Trace and what it means and to enjoy and respect the land. 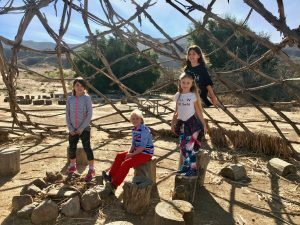 The girls even got to go inside a Chumash Structure hut. After the hike, we met up at the Cultural Center and met with a Native American, Mike, and he helped the girls learn how to make a Dream Catcher. To me, it is a little harder than it looks but not so bad once you got the hang of it. It was nice because the girls learned the true meaning of Dream Catcher from Mike who learned from his family history which was very interesting. Dream Catcher making can also be a part of earning the Outdoor Art Creator Badge. Satwiwa also offers tarantala hikes and star gazing, which are both very popular. Of course the girls had a great time. 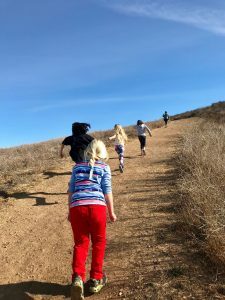 I encourage you to check out your local National Park because there are fun activities aimed at kids and adults alike! At many locations, these activities are offered year-round. My name is Bernadette Perry and this is my 4th year as Girl Scout Leader. I was a Co-Leader for last 3 years and started my own troop this year because some of us were looking to be more active with the Girl Scouts. We are a 3rd Grade Brownie Troop. I work for the National Park Service in Santa Monica Mountains Recreation area which covers LA-Malibu-Oxnard and points in between. I am married and have an 8 year old daughter, a 6 year old boy and a German Shepherd.